In partnership with UniVoIP, PCS is hosting a webinar on December 12th focusing on the importance of integrating your telephony platform into business processes. Register today for this highly anticipated, complimentary webinar on cloud-based integrations. 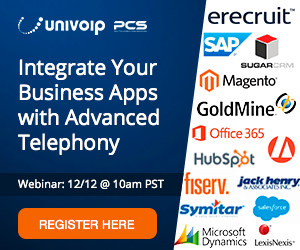 In this webinar, integration experts, Che Cullenbine of UniVoIP and Tim Zarkovacki of PCS, will showcase how your company can experience tremendous productivity gains, improved employee collaboration, increased customer satisfaction, and lower cost structures by integrating telephony with business applications. Does your phone system align with how you do business (or business process)? You may be losing out on service and marketing opportunities due to the lack of integration with your business phone system. Hear from top industry experts on how to leverage cloud integration to power business processes and focus on automation, simplification and enhancement. Palitto Consulting is pleased to announce our partnership with UniVoIP, offering a variety of value added services to their clients. UniVoIP provides cloud-based collaborative solutions that drive performance, productivity and efficiency for organizations in a variety of industries including education, legal, finance, nonprofit, real estate and healthcare. PCS offers custom integration and other professional services to help clients integrate business systems with the UniVoIP platform and technologies. Our goal is centered around business processes, with a focus on automation, simplification and enhancement. PCS and UniVoIP will integrate with Salesforce, Zoho, eRecruit, Fiserv, Google Apps, Jack Henry Symitar, Infusionsoft, Abacus Law, Evergreen, Freshdesk, Magento, Oracle, just to name a few! To learn more about our partnership, check out our page www.maximizingunivoip.com. To register to the webinar, click here.